The logo from the front page of Saulė, Friday, May 3, 1912. Between 1864 and 1914, over 400,000 people emigrated from the Baltic region. Pennsylvania became home to one of the largest concentrations of Lithuanians in the United States. Many Lithuanians settled in the small coal mining town of Mahanoy City in northeastern Pennsylvania. As the Lithuanian population grew, so did the need for a newspaper printed in its native tongue. A Lithuanian press would provide contact and communication with the outside world. A newspaper would educate immigrants and help them adjust to a new life. It would simultaneously play a key role in organizing and preserving Lithuanian language and culture. Most importantly, the papers printed in the United States would be free of czarist censorship and suppression. 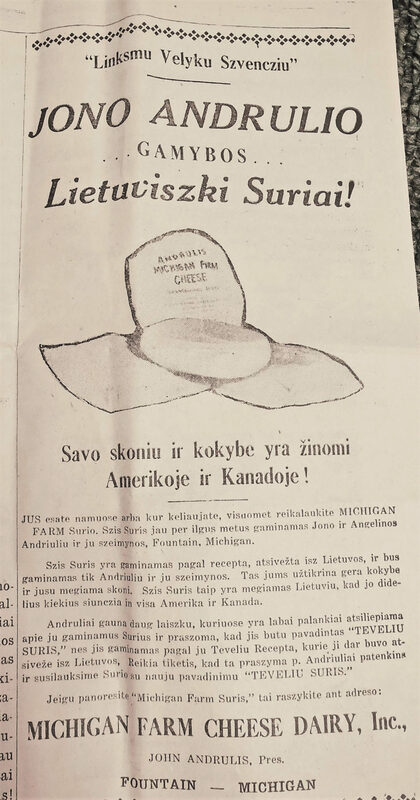 Worldwide, the Lithuanian periodical press was dominated by newspapers published in the United States for an extensive period of time. In 1889, eleven of the eighteen Lithuanian newspapers printed anywhere in the world were published in the United States! Due to ongoing repressions of the press in Lithuania (spaudos draudimas), the remaining seven were pub- lished in East Prussia. The most successful and widely circulated paper took root in Mahanoy City, Pennsylvania. Domininkas T. Boczkauskas (Dominik T. Boczkowski or Bačkauskas) was born in 1846 in Kupriškiai Serniškiai, Lithuania. He was a skilled musician and served as the church organist for the villages of Alvitas and Griškabūdis. He was a patriot, and along with other citizens from the Pol- ish-Lithuanian Commonwealth, participated in the insurgency (sukilimas) against the Russian Empire in 1863-64. Ultimately, the uprising was unsuccessful and resulted in even tighter Russian control. Punishments were severe, public executions were commonplace, and deportations to Siberia were massive. After enduring many years of Russian oppression, Boczkauskas left his homeland, arriving in the United States in 1879. He was fluent in both Lithuanian and Polish, and began working for a local newspaper. From 1883–85 he edited the Polish newspaper, Ojczyna (The Fatherland) in Buffalo, New York. In 1886 he became the first editor of Vienybė Lietuvninkų (Lithuanian Unity) in Plymouth, Pennsylvania, which had a large Lithuanian community. A page from the 1900 calendar booklet sent to all Saulė readers. 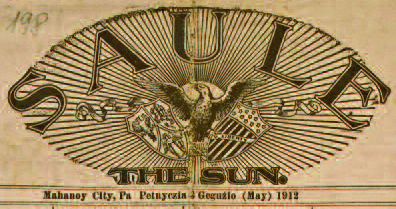 Saulė employees recalled that the first issue was printed in a cramped, dark and cool cellar on the corner of B and Pine Streets in Mahanoy City. Boczkauskas worked long hours with the assistance of his 15 year-old daughter, Liudvika (Liudwika), and 13 year-old son, Pranciškus (Francis). Because he did not have his own printing press, Boczkauskas had to physically transport the heavy lead-based type to an English-language print house. He did this in the sweltering heat of summer and the ice and cold of winter. With time, he obtained enough money and resources for his own printing equipment. In 1896, the newspaper moved to a larger building located at 523 West Spruce Street, and then to 520–522 South Street Alley. At first, Saulė was a weekly publication. In 1902 it was expanded to a semi-weekly (Tuesday and Friday) publication. Marking its 20th anniversary in 1908, the celebratory Saulės Kalendoris reported that the newspaper had sixteen employees. Saulė newspaper reported the important news of the day to its readers. On September 30, 1888 it described the establishment of a new Lithuanian Catholic parish in Mahanoy City – St. Joseph’s Church. Saulė also closely covered news relevant to coal miners, including the anthracite coal strike of 1902, which demonstrated the power of organized labor and unions in the U.S. In addition, the paper printed humorous articles, brief fictional stories and a gossip column, which appealed to the workers. In addition to the biweekly newspaper, every Wednesday Boczkauskas also printed a light-hearted weekly publication called Linksma Walanda (Happy Hour). He also printed books, short stories, calendars and prayer books, which were well-liked among the coal miner families. His most popular publication was “One Thousand and One Nights,” which had three printings. From 1888 to 1905 Saulė published 85 titles with a total press run of 53,250 copies. He also published textbooks, song books and a yearly almanac, the 1898 edition of which had a print run of 4,000 copies. These popular books served not only as a source of information, but also as a tool for education, and through these books many illiterate Lithuanians became inspired to learn how to read. The newspaper’s language style was old-fashioned, written in a dialect that was understandable by all Lithuanians, and the topics were written for the “common man.” According to Giedrius Subačius in Studies in Baltic and Indo-European Linguistics, what made Saulė unique was that it did not comply with the standard orthography of the time. The newspaper used alternate, older orthographic features that were popular in mid-nineteenth century Lithuania. The newspaper was typeset using the Polish convention of writing “cz” and “sz” for “č” and “š” (even his own surname, both Lithuanian and anglicized, was usually written with “cz”). The Saulė paper was among the last to accept the modern Lithuanian alphabet. Domininkas Boczkauskas, died on February 25, 1909. Despite a long illness, he remained at his desk, working almost to the end. His three sons, William D. Boczkowski, Francis W. Boczkowski and Victor L. Boczkowski acquired ownership of the newspaper after their father’s death. William became the president and business manager, his brother Francis became the editor, and Victor, co-editor. By 1916 Saulė moved to a large three story wooden building on the corner of South and A Streets. On July 27, 1920, Saulė celebrated its 32nd anniversary. The paper continued to be published on Tuesday and Friday and reached a great number of Lithuanians throughout the world. With readers in many of the world’s cities, it had the honor of having the highest circulation of any Lithuanian paper published at the time. 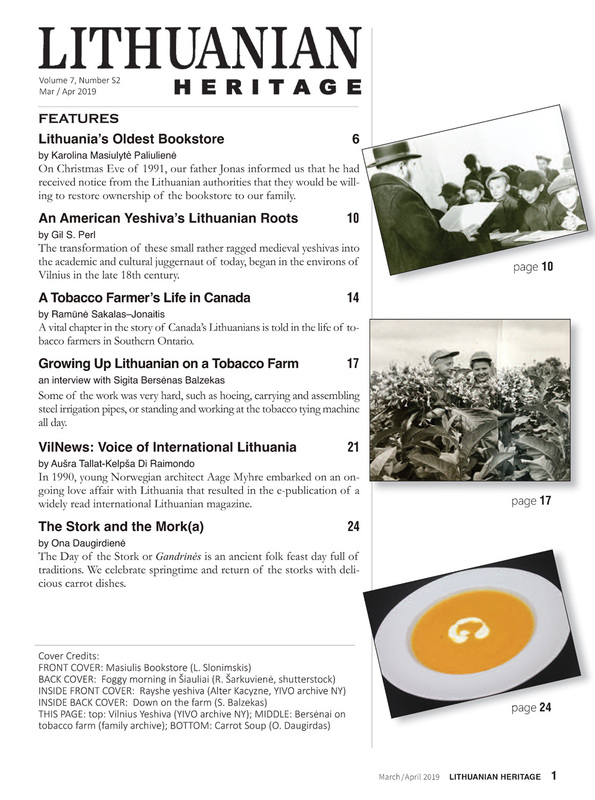 Saulė continued its mission of fostering community ties and providing domestic and international news for the Lithuanian diaspora. Saulė took pride in the fact that it maintained a non-partisan viewpoint when reporting on pertinent news of the day. The newspaper covered the activities of the National Guard sent to keep peace during times of social unrest. It wrote stories about arrests and clashes between picketers and coal company police at various collieries. It described incidents of sabotage at mining operations and strikers stopping trolley cars to attack passengers suspected of sneaking to work at out-of-town collieries. All these events were reported fully, factually, and fearlessly. 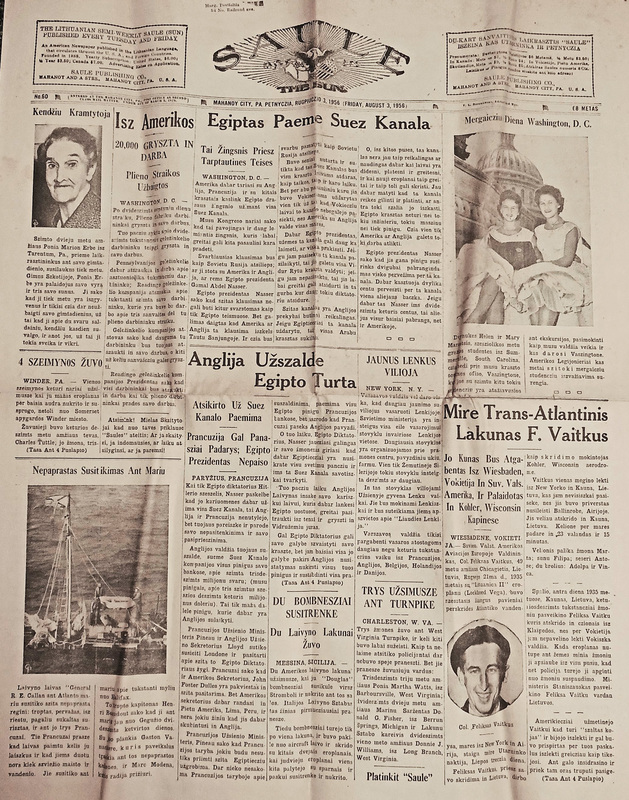 The “sun” finally set on this historically significant Lithuanian newspaper on June 26, 1959. 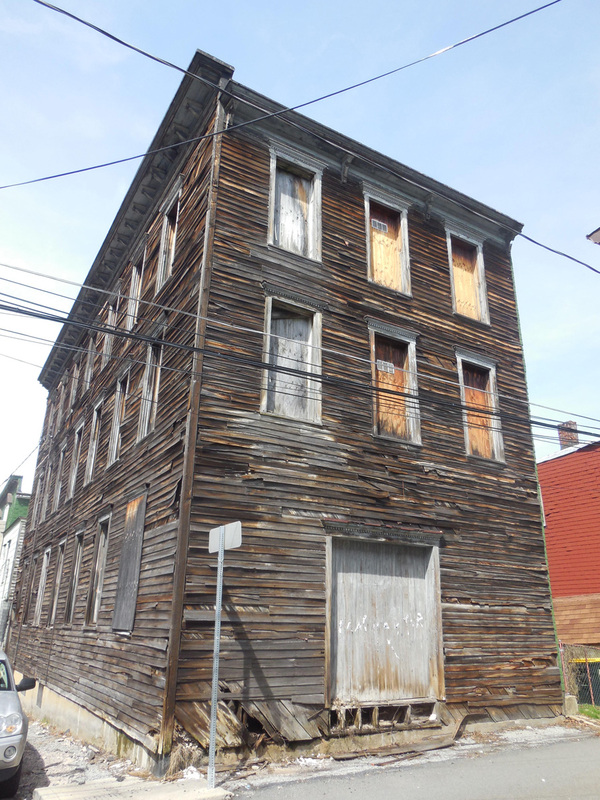 Today, the Saulė printing house at the corner of A and 337–339 South Street in Mahanoy City is vacant. 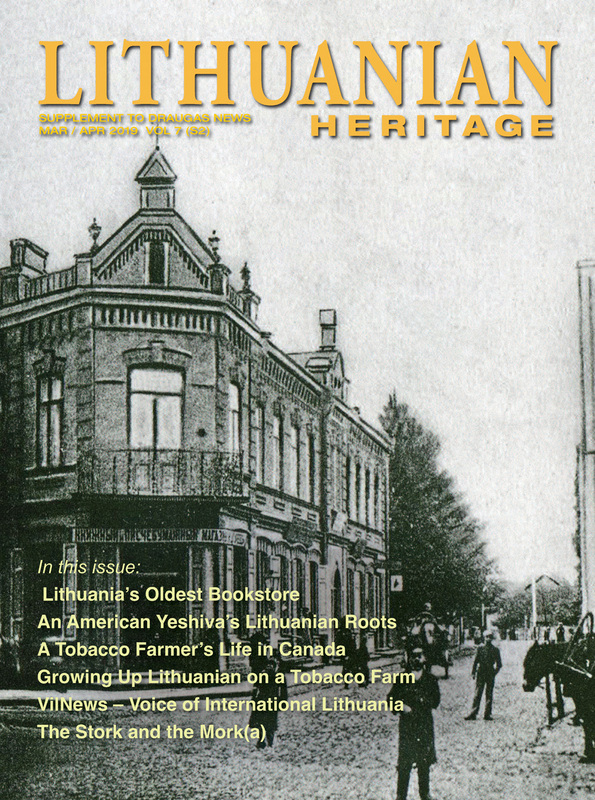 A few copies of Saulė remain in the archives of the Knights of Lithuania Council #144 Lithuanian Cultural Center at 37 S. Broad Mountain Ave., Frackville, PA.
Saulė is now a historic paper record immortalizing the lives and times of 19th and 20th century Lithuanian immigrants in the United States. But when it was founded 129 years ago, the newspaper was dynamic and alive and very much involved in those lives. It helped inform and unify a broad community. And it often did so by making people laugh. It was an amazing gift to its readers for many years! 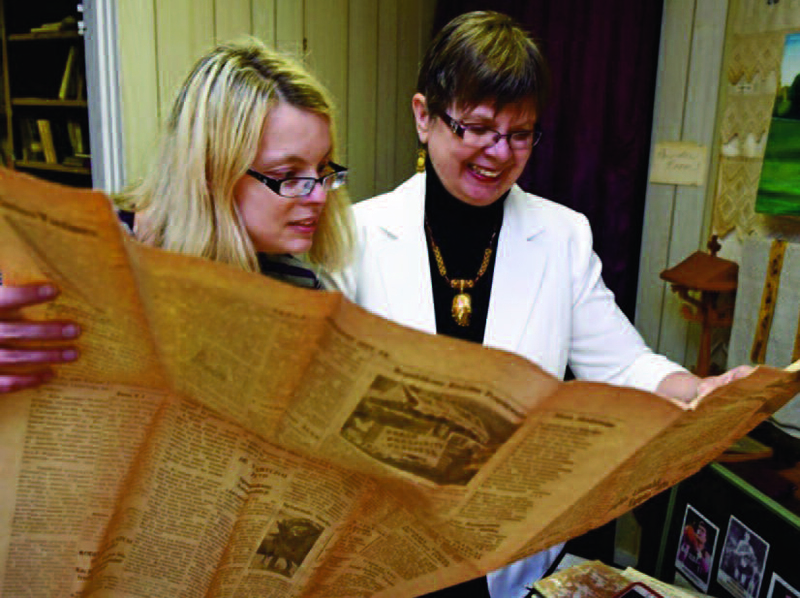 The author and her mother, Elaine, reading an archival copy of the Saulė newspaper. Vacant Saulė publishing offices in Mahanoy, PA.
Issue of Saulė from Friday, August 3, 1956 reporting on the death of pilot Feliksas Vaitkus. Add for “Andrulis” farmer’s cheese in the Saulė newspaper over Easter. 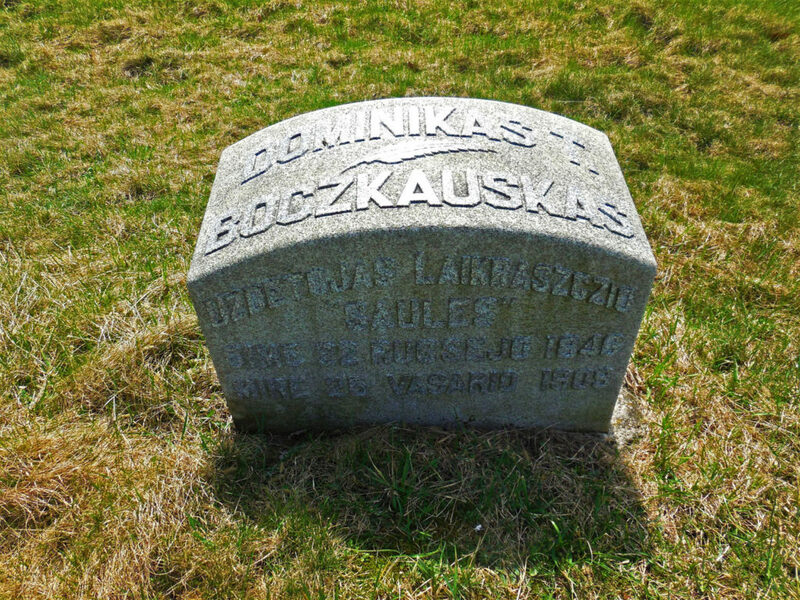 Gravestone marker for final resting place for Dominik Boczkauskas.